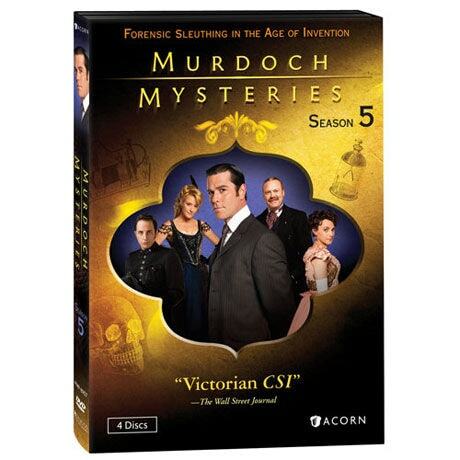 Smart and engaging, this award-winning mystery series centers on the brilliant detective William Murdoch (Yannick Bisson, Sue Thomas: F.B.Eye), a pioneer of crime-solving technologies in Victorian Toronto. 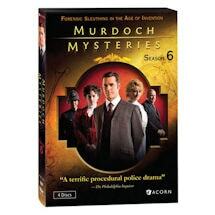 Still reeling from a personal and professional crisis, Murdoch has taken up gold prospecting at the start of Season 5. Soon he's back in detective mode, helping a woman accused of murder; investigating an Egyptian curse; experimenting with time travel; and crossing paths with Jack London, Henry Ford, and his idol, Alexander Graham Bell. 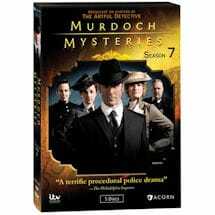 Meanwhile, Dr. Ogden (Gemini® winner Helene Joy, Durham County) hires a feisty new coroner, Dr. Emily Grace (Georgina Reilly, The L.A. Complex), who catches the eye of Constable Crabtree (Jonny Harris, Hatching, Matching & Dispatching). 13 episodes, approx. 10 hours, 4 DVD or 3 Blu-ray discs, SDH. 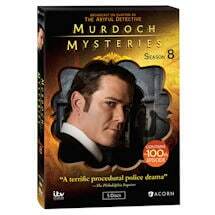 We regret we cannot ship Murdoch Mysteries to Canada. Item can only be shipped within the Continental US. Murdoch has become a gold prospector in the Klondike. 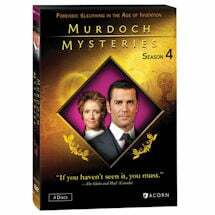 When a woman arrested for murder asks him to help prove her innocence, Murdoch is reluctant to return to his former line of work. Meanwhile, Crabtree struggles to lead his first investigation on his own, and Dr. Ogden begins training a new coroner. With tensions simmering between Protestants and Catholics, the police department is on high alert during an Orange Day parade. When a town alderman is shot by a sniper in the midst of the festivities, Toronto's Irish Catholic residents fall under suspicion. When an Egyptian sarcophagus is opened at a museum exhibit, a hidden cobra delivers a fatal bite to one of the expedition's archaeologists. Further strange incidents incite rumors of a mummy's curse-and bolster sales of Crabtree's Egyptian-themed adventure novel. A bomb explodes a storefront, injuring Crabtree and Higgins. Although the shop's proprietor has many enemies, government agent Terrence Meyers believes the bombing was an anarchists' attack. Murdoch and Meyers go undercover to infiltrate the group. A young opera singer is poisoned during rehearsals for La Boheme in an apparent attempt to kill the prima donna, Rosa Hamilton. 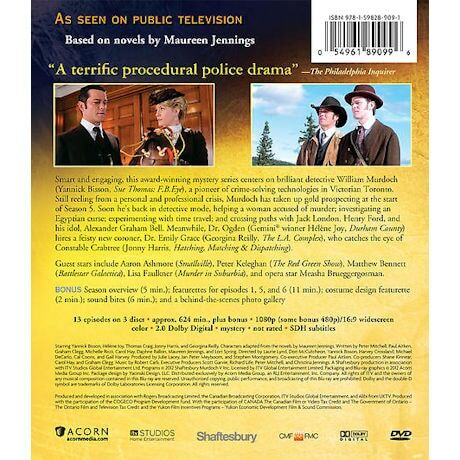 Inspector Brackenreid, an ardent fan of Hamilton's, offers to protect her from a potential stalker. Episode 6: Who Killed the Electric Carriage? 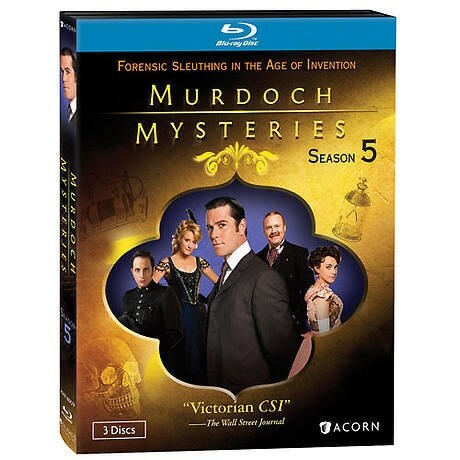 When an inventor dies under mysterious circumstances, Murdoch comes across an old acquaintance, a battery-operated vehicle, and Henry Ford in the course of his investigation. The abduction of a librarian reveals that the seemingly shy young woman harbored a secret life and reunites Murdoch with a former flame. Dr. Ogden ends up on the wrong side of the law when she agitates for women's rights. The Black Hand reenters Anna's life, and the investigation into the librarian's death heats up when another young woman becomes a victim. Crabtree discovers clues in some steamy stories, and Dr. Ogden's political views cause tensions with her husband. A shot fells a deeply disliked inventor after he wins the top prize at an invention convention. 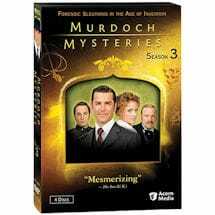 His fellow exhibitors, including Alexander Graham Bell, become suspects, particularly when Murdoch uncovers the ingenious method used for the murder. On a stormy night, a game of cards among Dr. Grace's friends ends with a man's death. 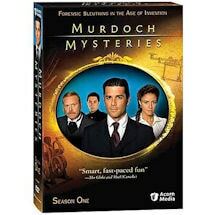 Murdoch goes to investigate and discovers the group was involved in otherworldly experiments. Meanwhile, Brackenreid and Crabtree guard a witness from a master criminal. 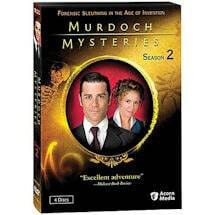 A girl is abducted from her home, and a talking doll left at the scene mentions Murdoch by name. As the detective chases down the culprit, he's met at each stage by more dolls taunting him with clues and ultimately threatening what Murdoch holds most dear. When a hockey player dies after a fistfight with a teammate, it appears to be a tragic accident. As Murdoch digs deeper, he reveals simmering tensions among the players and team owners that could alter forever the future of the sport. As the dawn of the new century approaches, the team face difficult decisions about their lives. Murdoch confronts the future in more ways than one, as a scientist comes to town claiming to have made a time machine.